Praise our feline companions! for they do us all a favor by being the neat freaks they are. Fastidious by nature, cats tend to conduct their business indoors in a clean litter box which eliminates the need to be walked or let outside. Yet, I’m sure we can all agree that cleaning after them can be a daunting task. But what if I told you there’s a way to make the process as low-maintenance as possible? Enter the world of automatic cat litter boxes. We’ve put together a list ranging from the top-rated, premium models to the more affordable if you’re shopping on a budget. No matter which one you end up buying, you’re favorite mouser will love you for it. Unique design, doesn’t use rakes. This is your crème de la crème, we would even go so far to say the best automatic self-cleaning litter box on the market. Almost completely enclosed, it has amazing odor control. This makes it perfect for any room in the house, even in an office if your cat is the corporate type. It doesn’t need daily attention, checking on it once a week should be enough, put a new bag in it and you’re good to go. This is a fully self-scooping device with an adjustable timer (3-7-15 minutes) after which the cleaning cycle commences. The quality of this appliance is impeccable, while one of the downsides is definitely the price, you are getting your money’s worth and it doesn’t need any special manufacturer’s supplies so, in the long run, you’re saving money. The unique spherical design of the litter chamber makes it very efficient in separating clumps which are then accumulated in a separate drawer. There is an indicator when it’s full so no more guessing. Overall a great product for all cat owners, especially ones that love spending their vacations without asking their neighbors for favors. One thing we found to be a common downside is that sometimes the globe doesn’t complete the rotation due to it being cluttered with too much litter so be sure to keep an eye on that full line indicator. We highly recommend the Litter-Robot III, it definitely exceeded all our expectations. Are you looking to go fully automatic? Then there’s only one choice for you. The CatGenie 120. With its one-of-a-kind system, it disposes of waste and even cleans itself using biodegradable sanisolution cartridges. It uses special washable granules that resemble standard cat litter. The liquids drain away and get flushed and the granules get dried off by the machine so you won’t have to worry about changing them anytime soon. One of the downsides would be granules ending up outside of the device due to its size but you can counter this by getting the sidewalls. They come as an optional accessory. You could use a dome as well but it is not recommended for larger cats. If you own a long-haired cat be sure to brush her from time to time, few customers have reported that the impeller can get clogged with hair. Installing the device is easy, all you need to do is hook it up to a cold water line and a waste drain pipe. Also, you will need an electrical outlet. Overall this is a well-built appliance that is ideal for someone looking for low-maintenance solutions to his feline friend’s needs. Easy to clean, you can remove all parts. 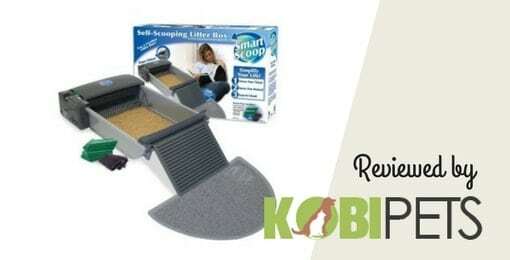 When we tried out the SmartScoop Litter Box, the first thing we noticed is how easy it is to use and how effective it is at what it does. 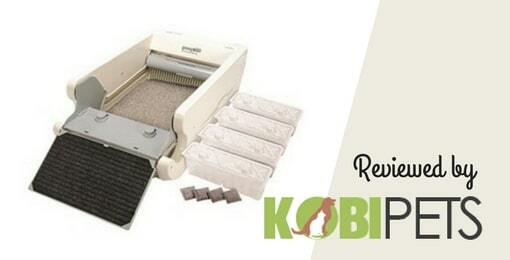 It utilizes a rake-scooping method that starts working 15 minutes after your kitty has finished its thing. The rake pushes all the formed clumps into the waste container, but as a safety precaution, it will stop working if your cat re-enters. We did notice a downside here, this is definitely not a quiet device. While this self-cleaning litter box definitely removes the everyday hassle that comes with your old-fashioned sandbox, it is recommended that you check up on it every 2-5 days to see if the plastic bag is full. This will, of course, vary depending on how many cats you’re living with and their excretion habits. Luckily, the waste bag is easy to remove and it takes just a few moments to replace it. Cleaning the unit is a breeze since all the parts are removable, just wash them down with soap and warm water. Skip the washing part when it comes to the motor unit. 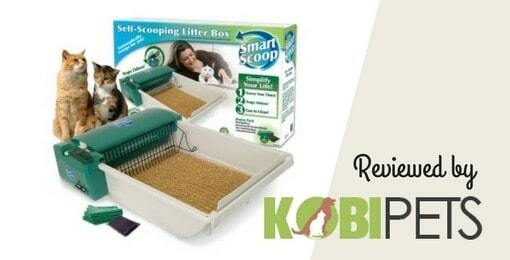 The SmartScoop has its flaws like the noise and the rake not going all the way to the bottom of the tray which can be annoying if your cat loves to dig deep, but overall it’s great at what it does, as long as you remember to clean it from time to time. While we are going to cover the original model as well, let’s talk about it’s younger brother, the ScoopFree Ultra. 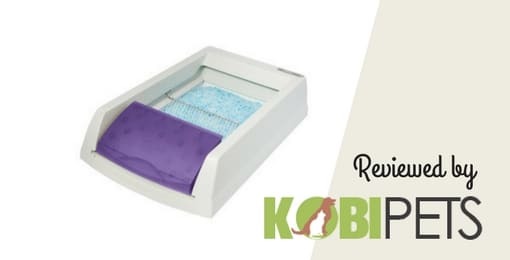 Probably one of the best automatic cat litter boxes on the market, it utilizes disposable litter trays with blue crystals that do an amazing job absorbing liquids and controlling odor. The crystals constantly remove the odor which makes them much more effective than regular clumping clay litters. So what makes the Ultra version so good? Well, it’s the quality of life improvements and a few extra features like the health counter that tracks how often your kitty uses the bathroom. You can finally adjust the delay before the rake cycle begins and set it between 5 and 20 minutes after your cat has left the litter box. The timer still resets if your pet re-enters. And finally, there’s the Privacy hood that keeps the crystals inside the litter tray and guarantees your cat a secluded trip to the bathroom. 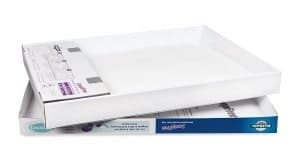 While the appliance itself falls into the category of the more affordable, the main downside to this system is the price of the disposable trays. Some customers have also reported that they’ve experienced small leakage since they are made out of cardboard. The solutions we found to be effective is getting a plastic reusable tray and buying the crystals separately. Large waste receptacle, can use plastic bags as well. After trying out this automatic litter box for a while we came to the conclusion that it has a few things going for it. The system works great, motion sensors detect your cat leaving the box and after 20 minutes the automatic scooping commences. That’s more than enough time for the clumps to completely form so the rake can scoop them up efficiently and move them to the waste receptacle. The waste receptacles that came with the appliance are about 4 inches tall and about 3 inches wide which is more than enough space. However, we found that using a plastic liner will be more efficient cost-wise. Not only that but it also helped with stopping excess litter ending up on the floor. 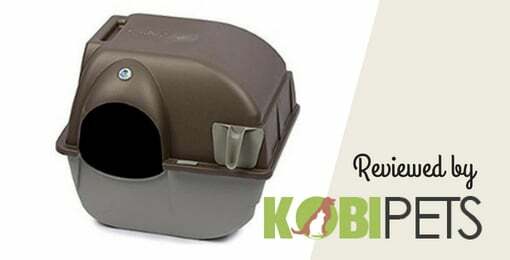 Size-wise, this is one of the bigger self-cleaning litter boxes on the market and it is suitable for multiple cat owners just as the name implies. It can be noisy but it also has a sleep mode for up to 9 hours. If you want to turn it on for an extra cycle there is a manual mode as well. The rake is removable so it’s easy to clean, the tall side-walls do an amazing job at keeping everything inside of the box and there’s even a ramp that helps with litter tracking. We would recommend giving special attention when cleaning the sides of the tracks, this will help in avoiding the rake getting stuck. Overall, we liked this unit and would definitely recommend it for a household with multiple feline residents. Similiar in design to one of the products we already reviewed on this list, yet it has some distinctions we really liked. The side-walls being taller for one. It uses the same rake-scooping method that works great and will save you money when it comes to buying litter. Speaking of saving money, the Pet Zone Smart Scoop does not need any special extra supplies. It comes with 6 no-touch plastic bags, but any plastic bag will work fine, just make sure to spread it as much as possible. You can use your favorite clumping cat litter, if you need a suggestion which one we liked the most, keep reading. So it has a good price, does the job, it’s quieter than you would expect from a model of this kind, so what did we not like about it? Since the rake is scooping and not pushing, you will have to level the litter by yourself. This means you will have to check up on it more often than with other systems. Also, if your cat is a digger, chances are it will cover the clumps making it harder for the rake to pick them up. While it has great odor control thanks to the carbon filters, we found that they don’t last as much as we hoped. On the upside, this is a modular unit, making it super easy to clean. Overall it’s very competitive for the price point. This list wouldn’t be complete without the PetSafe ScoopFree, one of the best automatic litter boxes out there. It’s more affordable than the Ultra version and it uses the same blue crystals that do an amazing job at absorbing liquids and reducing odor better than regular litter. 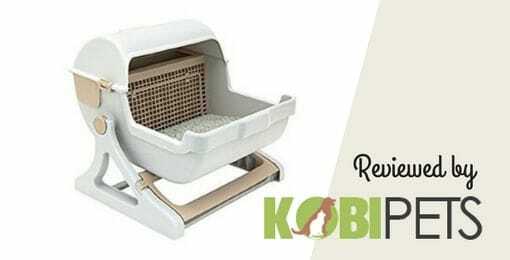 The cardboard litter trays that are compatible with this unit will last you about 2 to 3 weeks and they are very reliable as long as you use them correctly. As we already pointed out with the Ultra version, maintaining the system could be less cost-effective in the long run, so you should consider getting a plastic tray and just refilling the crystals. Unlike the Ultra, this unit has a fixed 20-minute delay before the cleaning process starts, however, this is an ideal time period for the waste to dehydrate and the clumps to form. This way your rake will scoop all those solids effectively. While it’s working it does not emit loud noises, it’s definitely one of the quieter machines in its category. 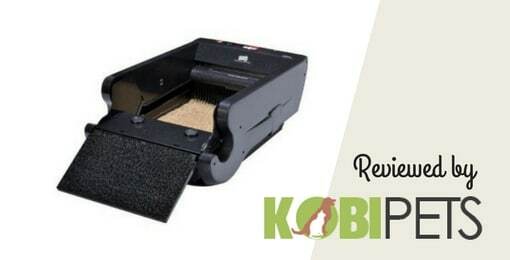 This automatic self cleaning litter box can do wonders for your household, and it really is low-maintenance, but we would recommend getting it if you’re a single cat owner due to the cost of maintaining the system. Littermaid has been a household name on the market for years now so they must be doing something right. LM980 model continues this tradition and offers value for money. You’re getting a large, sturdy appliance that will automatically scoop your cat’s feces and do a pretty good job at it. This model comes with a high-quality, plastic rake instead of a metal one. It gets less dirty and is easier to clean. When you want to clean it you can remove it with a touch of a button and voila. The side-walls are tall enough and there is a small ramp that helps with litter tracking. We must remind you that, even though the Littermaid does a fantastic job, this is not an automatic litter box you can leave alone for days. It comes with a scoop and you’re going to have to use it periodically to even the level of the litter and clean the sides. The main downside we found was the noise it makes while running. The motor is loud so make sure not to put it next to your bedroom. The actual size of the litter area could be larger, it measures approximately 13.5″ x 2.5″ x 17.5″. Also, the gap between the rake tines could be more narrow. Another clever design on this list, it tries something else and succeeds. It features a swinging bottom part, resembling a cradle. You use it by tilting the bottom at a 90-degree angle. The waste gets separated this way and falls into the receptacle. Tilt it back and you’re done. No muss, no fuss. Since this is a semi-automatic model, it doesn’t make any noise, also it doesn’t require an electrical outlet, so you have more choices when it comes to choosing where you want to place it. It’s well built, using high-quality polypropylene plastic that is environmentally friendly. What we didn’t like is the actual size of the litter area, it can be a tight fit for larger cats. Also, if you’re living with a male cat, this might not be the best option for you because the side-walls are not high enough for high spraying cats. 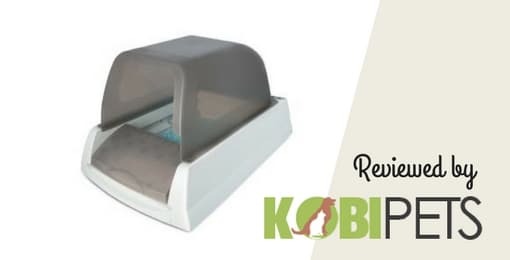 We recommend using premium clumping litter for odor control purposes since this is an open design and the waste drawer is covered but not sealed. This is not necessarily a bad thing, this way it’s more hygienic than some of the enclosed models that work on a similar principle. It’s also an improvement when it comes to potential urine leakage since the bottom is seamless. It’s technically a manual litterbox. Now the Omega Paw might seem like the odd one on this list since it uses a completely different method. It’s not your typical self cleaning litter box. Still, you got to admire the clever design, and it actually works like a charm! It’s so simple that you can clean it in under a minute. All you do is roll the box completely in one direction and then back. The solids get separated by a grill and they end up in a compartment that is actually a pullout tray. This kinda makes it a manual litter box but it eliminates the need for scooping which is the point. Also – no noise! Since it’s enclosed, it gives your cat it’s privacy and keeps all the odor sealed. A thorough wash is recommended once a month. A pro tip is to get a cat litter mat and put it underneath, this will help with collecting residue when rolling the unit and will keep your floors clean. Not sure which one to buy? You can find our choice below. Even though the Omega Paw requires a little more attention than other products on this list, the system has so many advantages. The unit is well-built but some customers did report problems with longevity. Still, It’s very affordable and does the job perfectly. Overall, we enjoyed it and it deserves a place on this list. While we covered some smart design solutions, this one falls just short of that category. Using a conveyor is a good idea but running it 24/7 will make the motor hot as a stove in no time. Our suggestions would be implementing a timer which would solve this obvious flaw. The other thing we didn’t like is the real estate it offers. The litter area is suitable only for cats that are of small stature. If it was more spacious it would accommodate larger cats as well, making it much more versatile. Also, this would help with the amount of litter ending up outside of the box. Overall, we were very excited by the idea that all you need to do is empty the waste compartment from time to time, but using this unit ended up being almost a bigger chore than owning a standard sandbox. It was just too much maintenance for our taste. There’s a couple of things to keep an eye on when deciding which self-cleaning litter box is the ideal choice for you and your furry friend. These are a few things to take into consideration, also, it’s worth noting that you should have a clear idea where you’re gonna set up your system. Make sure there’s enough space and that it is not high-profile spot. But wait, why would you even consider buying one of these automatic thingamajigs when a simple plastic container does the job? Besides the obvious reasons? Like less time spent cleaning after your pet every single day and more time cuddling and potentially stopping him from pushing your favorite antique vase off the counter. Here are a few more benefits you’ll be enjoying. First of all, the odor. Automatic and self-cleaning litter boxes do an amazing job of keeping your house smelling nice and clean, and some of them are even enclosed so you can place them anywhere. You will love your odorless space and you know who else will love it? you’ve guessed it, your scent-sensitive kitty resident. They eliminate the daunting and disgusting task of scooping. Most of these devices require your attention once a week, some even less. Also, they are extremely sanitary since you have minimum contact with the litter. Your cat will be a happy little camper because it’s “bathroom” will always be squeaky clean. The average delay between cleaning cycles for automatic self-cleaning litter boxes is 15 minutes which means your cat will always be met with a fresh comfort station. This is mandatory for your pet’s happiness, remember, these animals love their finicky nature. Some even go so far that they will refuse to relieve themselves if their litter box is dirty. They might choose to take their business elsewhere, for instance, your brand new Egyptian carpet. You can get away with using one litter box. If you are an owner of multiple cats in the same household you are aware of the rule of one standard sandbox per cat. 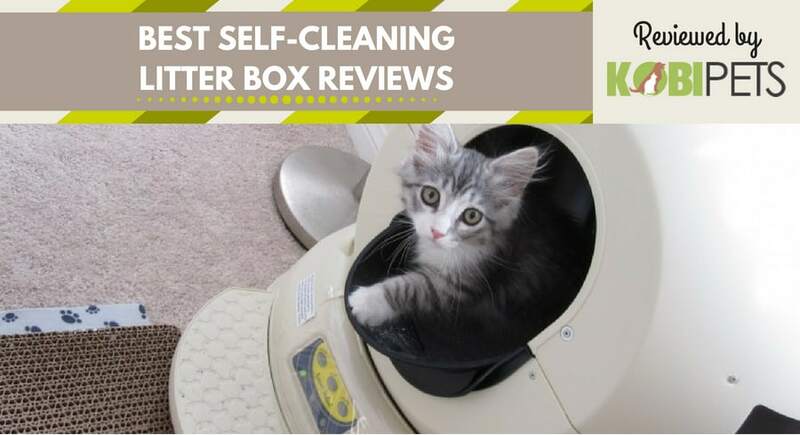 Well thanks to the automated features of the best self-cleaning litter boxes on this list, you can get away with using just one most of the time. While we are sure that you won’t regret buying any of the products from this list, there are a few downsides to owning one of them. Solution: Check our pro tips for every product. While the initial investment might not seem significant, getting all the optional accessories can hurt your wallet. Unless your product is still under warranty when it breaks down, you are going to have additional expenses. Solution: Always keep your receipts, do not try fixing it yourself in order to avoid warranty voiding. 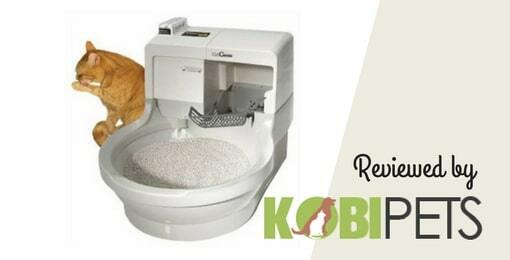 How to Choose the Best Automatic Cat Litter Box? This is a tough one, all the products we listed are great, so picking the best for you will depend on multiple factors. What works for one customer might not be ideal for another. Same goes for their feline friends. Here are a few things you should consider before picking the best automatic cat litter box for you. Are you okay with checking up on the litter box every day? While we listed some fully automated models (CatGenie), most of these litter boxes still need your attention. This is not necessarily a bad thing. If any health issues with your pet arise, you will know about it, but you still won’t have to scoop every time your pet goes to the restroom. How many cats are you living with? Some models are not designed to handle multiple cat households. This is mostly due to the size of the waste compartment or if the box uses special litter trays/pads they might not last as long as you would like. Age could very affect your choice. Some models are not ideal for kittens, others are hard to reach for older cats(Le you pet semi-automatic quick cleaning cat litter box). So you’ve decided you’re going to treat your cat (and yourself) with an automatic litter box, still estimating your budget and you’re looking into additional equipment. Well, this will depend on the system you choose. Some will work just fine with any premium clumping litter(don’t buy the cheap stuff, you’re saving money on the litter with these appliances anyway) and your regular grocery bag as a waste compartment. If you’ve decided to get a system that uses clumping cat litter, go for a premium brand that forms clumps well. This will make your self-scooping machine do a much better job, and will save you money because you will be using less of it. If we had to choose one product, it would be the Arm & Hammer Multi-Cat Clump & Seal Clumping Litter and, judging by the reviews, there are many more fans of this amazing cat litter. It clumps very well and seals odor. It’s also dust free so when your self-cleaning litter box is doing its cycle, the dust won’t be flying in the air. 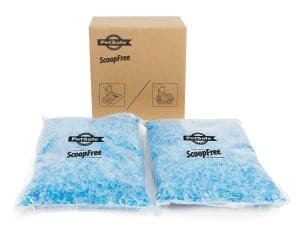 If you picked one of the ScoopFree models, you’re going to have to think about disposable litter trays (or check our tip on how to use a reusable tray). Pick a spot that’s less humid and well ventilated. 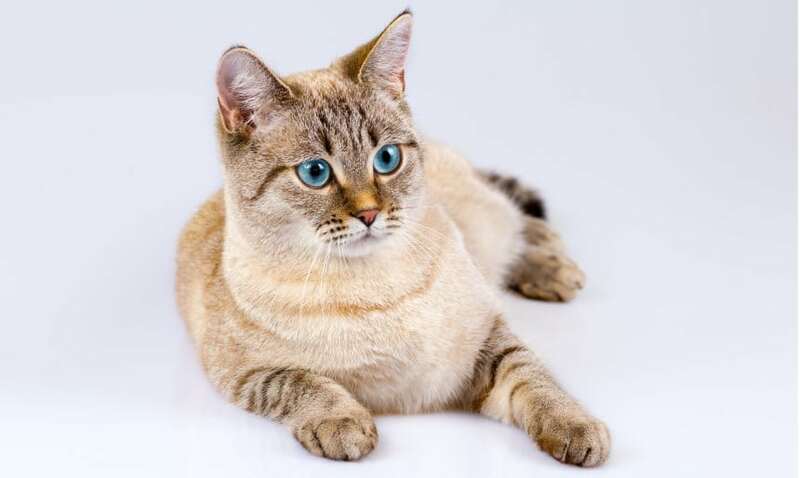 If you’re cat always urinates in the same spot, be sure to use a scoop and stir and mix crystals. If you’re using them for a younger kitten the trays won’t last you as long. This is because they tend to urinate more frequently than grown-up cats. In order to avoid leakage, we recommend replacing them every 20-30 days(single cat owners). Some litter boxes use patented pellet like litter. They are different than your conventional clay litter and are non-clumping. The urine passes through them, while the solids remain until scooped. Liquid ends up on the bottom and this is where Litter pads come into play. They kinda work like… well if you’re a woman you know. When they come into contact with liquids they turn them into gel, while also eliminating the unpleasant scent. Also, these can come in handy if you’re taking your pet on a trip. Just put it on the bottom of your pet carrier and you’ll avoid nasty “accidents”. 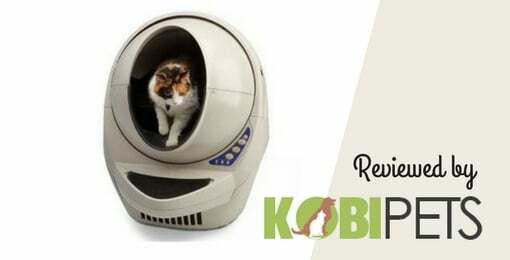 So you picked the Litter Robot III because of its awesome rotating globe, or the CatGenie because you want the most low-maintenance option. Maybe your cat loves watching the rake scoop up after she’s done with her business, so you’ve decided to get the Nature’s Miracle Multi-Cat Self-Cleaning Litter Box. All of these have one thing in common. They need an electrical outlet to work. Some have a battery backup but this cannot be your main power source. Looking for an alternative? Then the Omega Paw is for you. Once you set it up(follow the instruction manual if needed), plug it in, put a receptacle or a plastic bag in the waste compartment and pour in your favorite litter. The time it takes your pet to adapt to its new bathroom varies. Some pick it up right away, others, especially shy cats, may take a while. The best practice we found to work is putting your automatic litter box next to your older one. Stop cleaning the old one and your OCD cat will soon have no choice other than using it’s brand new shiny restroom. You can even put some already formed clumps in the new one so your pet recognizes the scent right away. 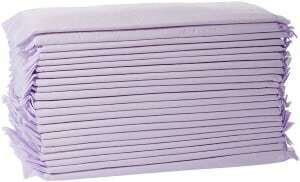 How to Clean an Automatic Litter Box? Besides emptying the waste compartments every 2-7 days, you will want to deep clean these appliances from time to time. While some require just a small wipe using light soap and some water, others need to be completely disassembled and thoroughly washed. For the latter, you want to check the instruction manual first. With most models you will be fine with using a damp cloth for wiping, it’s mandatory that you use mild liquid solutions. Remove the rake and the plastic tray and wash them down with warm water. If you’re cleaning the motor head make sure you don’t get any liquids on it. Also, you might want to use a dry cloth when cleaning sensors. Taking care of your unit is important for hygienic reasons but also it will greatly affect the longevity. Some automatic litter boxes experience malfunctioning just because they were neglected by their owner. How to Fix Automatic Litter Box? Disclaimer: we do not recommend trying to fix your appliance by yourself if you’re experiencing a serious malfunction. Most of the models come with some sort of guarantee and warranty. Call the manufacturer first and try to get a return merchandise authorization. The usual error customers encounter is the rake not finishing its cycle or continuously going through it. Solution: Check if there is litter or clumps pilled in front or even behind it. Before you do anything turn the device OFF and refrain from turning it back ON until you’re finished with tinkering. Another one is solid waste matter getting caught on the rake or tray. Solution: Spray dense water repellent oleum on the rake and on the tray before putting litter in it. Pro tip: use non-stick cooking oil. Dusty sensors can be a pain in the neck and can stop your machine from working. Solution: Make sure to brush them from time to time, also, litter shouldn’t be covering them so once again, pay attention to that fill line. After hours of testing ourselves and reading customer reviews, we came up with this list. Hopefully, it’s been helpful for you to get a better idea how self-cleaning litter boxes work and what to look out for. All of the items we listed do the job, it’s just a matter of finding the perfect one for you. Pay close attention to the section where we list key factors that will help you make your choice. Congratulations if you managed to go through the entire article. You are now a certified litter box expert. All joking aside, we advise you to read more reviews and get more feedback before making your purchase.